Korat cats are gorgeous domestic cats known for their blue-gray coat. A native of Thailand, the Korat cat is medium-size, semi-stout and surprisingly heavy. It is no wonder that cats of this breed are often compared to body builders. The Thai people consider the Korat as a symbol of good luck. In fact, experts indicate that the term Korat can be translated as "good luck" or "good fortune". In Thailand, they are known as the "Good Luck Cat". Korats are very intelligent and they love to play. They are also people-oriented and loyal. What else can you ask from a cat? The Korat was first found in Ampur Pimai, a region of the Korat province in Thailand. One of the earliest documents mentioning the Korat is The Cat Book of Poems, which was published from 1350 through 1767. This book lists the 17 "good luck cats of Thailand", one of which is the Korat. The Cat Book of Poems is currently housed at the National Library in Bangkok. The Thai people call Korats "Si-Sawat" cats, which means "color of the Sawat seed". The Cedar Glen Cattery of Oregon brought the first Korats to the United States in 1959. These Korats (brother and sister) were named Nara and Darra. The CFA accepted the Korat for championship status in 1966. The first Korat Grand Champion (CFA) was GC Jalna’s Ming-Ti of Chu'n Ch'i, a male cat. The Korat has a semi-cobby, muscular and agile body. These cats have a short neck and wide, strong, athletic shoulders. 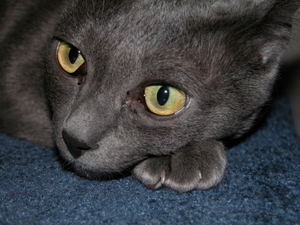 One of the Korat’s best known characteristics is its coat color. It can be described as blue-gray or silver-blue with a silver sheen. Indeed, no other cat breed sports such a unique coloring. The Thais refer to the Korat’s blue-gray fur as "rain-cloud gray". They refer to the silver shimmer as "sea foam". Interestingly, blue-gray (also described as silver-tipped blue) is the only color accepted for this cat breed. The Korat’s eye color is another interesting feature. Adult Korats have peridot-green eyes while Korat kittens may have amber to gold-green eyes. The first one is obvious: the Korat's head is heart-shaped. You will find another heart on the top of the head (you need to look down the head to see this heart). Then you will find that the Korat’s nose is also in the shape of a heart. The fourth heart can be seen in the chest. And the fifth heart is the most important of them all: the one inside the cat’s chest! Korat cats like people and are extremely loyal. They are very playful and notably intelligent. So if you are looking for a beautiful, one-of-a-kind, people-friendly cat, consider adopting a Korat. --In Thailand, a pair of Korat is given to newlyweds for good luck. --The Korat has changed very little over the years, making it one of the most stable cat breeds. --Due to interbreeding, Korat cats are very rare in Thailand, most breeders are located outside of Thailand. For more on gray cats and blue cats, you'll enjoy the following articles.